It gives me great pleasure to announce the winners of my two recent giveaways. Congratulations, Akoss! Expect an email from me asking for your mailing address. And thanks to everyone for supporting my blog. 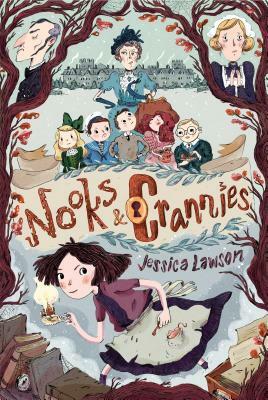 NOOKS & CRANNIES Giveaway, and an Exclusive Interview with Jessica Lawson! Synopsis (from Indiebound): "Charlie and the Chocolate Factory "meets "Clue "when six children navigate a mansion full of secrets--and maybe money--in this humorous mystery with heart. Sweet, shy Tabitha Crum, the neglected only child of two parents straight out of a Roald Dahl book, doesn't have a friend in the world--except for her pet mouse, Pemberley, whom she loves dearly. But on the day she receives one of six invitations to the country estate of wealthy Countess Camilla DeMoss, her life changes forever. Upon the children's arrival at the sprawling, possibly haunted mansion, it turns out the countess has a very big secret--one that will change their lives forever. Why I recommend it: Nooks & Crannies is clever and charming, with a spunky, inquisitive heroine and one of the most adorable pet sidekicks ever. Ten-year-old me would have hugged this book and carried it around for days. This is the perfect book for a cold snowy winter day, curled up in your favorite chair with a cup of tea and a few English biscuits. 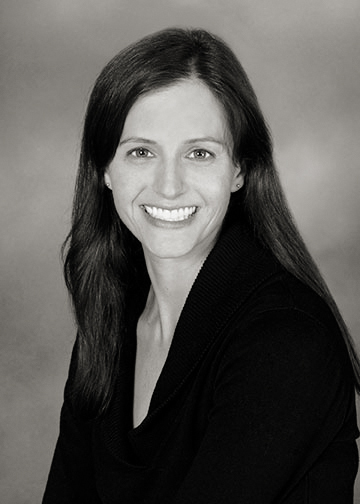 And now, I'm thrilled to welcome author Jessica Lawson back to my blog (see her earlier visit here) for an exclusive interview! 1) You must have read quite a few mysteries before writing this book. What were your favorite mystery novels when you were growing up? Growing up (age 8 or so), my go-to mysteries were the Cam Jansen books. As I got older, I graduated to my aunt’s baskets of paperback mysteries—Agatha Christie and Mary Higgins Clark and P.D. James. I was 10-12 years old when I first started reading them, and remember being fascinated by those books. And, while this isn’t book-related, I think that a big love for the more cozy-style mysteries began as a bonding experience with my mom. Starting around age 8 or 9, she would let me watch Murder She Wrote with her (with the fabulous Angela Lansbury as Jessica Fletcher) and we’d make 25 cent bets on “whodunit” after the first commercial break. 2) That's a fun childhood memory! Can you describe your writing routine? And is your writing area, by any chance, a nook? Details, please. With little ones around (one who still wakes up at night on occasion), my writing routine is very flexible by necessity. To make writing time happen, I’ve tried various strategies like getting up super early or having ready activities for the kids so that I can get an hour here, a half hour there. I can’t seem to stay up late to write—my brain works best in the morning hours and my creative energy is mostly sapped by the afternoon. So while I can edit at night if I’m on a deadline, I write and revise best in the earlier hours of the day. During warmer weather, my husband will take the kids outside or on a field trip for a few hours on the weekends, which is a big help. I know that some people say that you need to write a certain amount every single day, but it just doesn’t work out that way for me in this stage of my life. I think about writing and my current projects every day, and will have small plot epiphanies or sparks of dialogue come to me (in which case I’ll jot those down on a post-it for the next time I write). But some days, writing gets shoved off my schedule, and that’s okay. As for my writing space, sadly, it’s not a nook. How I long for a nook! Alas, instead, I park my laptop on the kitchen table and pile an extra chair with my notes. When company comes over, my “office” is moved to my bedroom floor. Not very glamorous, but between the kitchen table and the living/family room couch, I’ve managed to get a lot of writing done. 3) Well, that space seems to be working just fine for you! Jess, I'm not ready to let Tabitha go. Will there be any further adventures for our plucky heroine? Thank you for asking~ I would love to revisit Tabitha’s story and see what comes next! That said, there are no near-future plans for another Tabitha book—the books of mine that will come out in 2016 and 2017 aren’t set in that world. But I will be keeping her in my back pocket for future project ideas. I’ve also dabbled with the idea of writing a middle grade starring a 12-year-old Percival Pensive and his sidekick, Timothy Tibbs (the Holmes/Watson-esque fiction-within-fiction characters from mystery books that Tabitha Crum loves)~ if you read NOOKS & CRANNIES, you’ll see that Pensive novel quotes begin each chapter and those two seem like they’d be loads of fun to write about. 4) That would be fun! If you could live in a mansion with hidden passageways, what would you use them for? Oh, good question! I would use them for quick access to my massive library/kitchenette (I have my own mansion, right? It MUST have a massive library/kitchenette, right?) and for epic games of hide-and-seek and laser tag with my kids (note: I have never actually played laser tag, but it looks fun). Thanks, Jessica! I enjoyed having you back on My Brain on Books. Readers, I'm so in love with this book I want everyone to read it. I'm giving away an extra copy to one lucky winner. To enter, simply be a follower of this blog and comment on this post. Mention the giveaway on social media, and I'll give you more chances to win. Open to US mailing addresses only. This giveaway ends at 10pm on Sunday January 24 and the winner will be announced on Monday January 25. So you only have one week! Good luck! 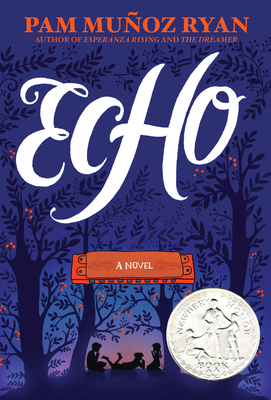 ECHO by Pam Munoz Ryan -- and Newbery thoughts, anyone? The Newbery awards (and other ALA Youth Media Awards) will be announced this morning in Boston at 8 am EST. I'm posting this at 7 am, so at this point, all I can do is wish and hope. I've read so many wonderful MG novels this year that it's difficult to pick just one I think should win. I have so many favorites: Blackbird Fly by Erin Entrada Kelly, Blue Birds by Caroline Starr Rose, Full Cicada Moon by Marilyn Hilton, The Thing About Jellyfish by Ali Benjamin, Goodbye Stranger by Rebecca Stead, along with others I haven't had a chance to blog about yet. Don't you wish all the books you read and loved this past year could win awards? One that's certainly deserving of multiple awards is a book published in February 2015, and which I finally read on my recent blogging break in December. Source: my favorite local indie bookstore, Children's Book World! Synopsis (from Indiebound): Music, magic, and a real-life miracle meld in this genre-defying masterpiece from storytelling maestro Pam Munoz Ryan. Lost and alone in a forbidden forest, Otto meets three mysterious sisters and suddenly finds himself entwined in a puzzling quest involving a prophecy, a promise, and a harmonica. Why I recommend it: Echo is 592 pages long, yet it was so fascinating and so beautifully written I read it in one day! I absolutely loved how the three seemingly-disparate storylines all came together at the end. And because the three stories all hinge on a harmonica, and my late father played the harmonica, this novel affected me in a big way. This is the kind of book that sends shivers up your spine. If Echo doesn't win at least a Newbery honor today, I'll be sorely disappointed. As the awards are announced, what books were you hoping would win Newbery honors or the Newbery medal? THE GOBLIN'S PUZZLE and a giveaway! I'm back from my blogging break, and for those who remember my TBR pile of eight books, well, let's just say I've read all but one of them, and I'm reading that right now! I also spent a lot of time with family (including my father-in-law who was in the hospital, but he's better now. Thanks for asking!). In the meantime, I missed reading your blogs and I look forward to catching up. 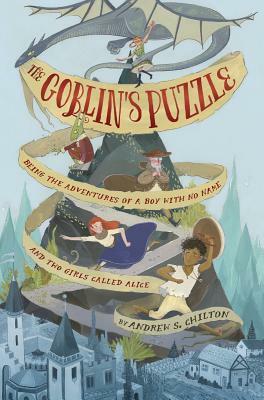 Why I recommend it: The Goblin's Puzzle is a deliciously inventive tale, smart and a bit sassy, and brimming with humor and wordplay. You'll cheer for the Boy and for Plain Alice, and even find Mennofar, the Goblin, growing on you. This is the kind of book destined to become a modern classic, one that adults and children alike will enjoy. If you liked The Bartimaeus Trilogy or The Princess Bride, you'll love this. Bonus: This is an excellent (and fun!) way to introduce young readers to the concept of deductive reasoning. Here's a link to a lively interview with Andrew S. Chilton on Suzanne Warr's delightful blog, Tales From the Raven. Her giveaway is now over, but mine is just beginning. That's right! Through the generosity of the publisher, I'm thrilled to award one hardcover copy of The Goblin's Puzzle to one lucky winner. To enter you must be a follower of this blog and you must leave a comment on this post. If you mention this giveaway on social media, please include a link and I'll give you extra chances to win. This giveaway is open to U.S. mailing addresses only and will end at 10:00 pm EST on Sunday January 24, 2016. The winner will be announced on Monday January 25, 2016.